Disclaimer: This is ENTIRELY an opinion piece. I am no Flames of War genius and am subject to my own biases. If you disagree I would love to hear from you in the comments section below. In this post I am going to focus mainly on what I think is desirable in the terrain for tournaments. Insanely dense bocage or city tables are really fun for friendly games, themed games and scenarios. Extreme tables have their place and can be good fun to add to an event to add some randomness and challenge. In this post I will focus on average tournament terrain as we use here in Western Canada for tournaments as most of our terrain aims for balance and moderate terrain. Density of terrain is probably the biggest thing I hear and read people talking about with reards to terrain. The common wisdom seems to hold that a terrain heavy table favours infantry companies whereas an open table favours tank companies. In my opinion, a moderately dense table benefits both attackers and defenders depending on how they use terrain. As an aggressive player, I love using terrain to protect my fragile assault assets until I can get close to the enemy. For tournaments, I think a variety of medium-light to moderately dense tables are ideal. I love the strategy of using terrain and the challenges of moving through and around terrain. The challenges of designing a good dense terrain board will be covered in the mobility section. A key aspect of a good tabletop layout is balance. Glen, one of my regular opponents, has some great tournament terrain boards that are very balanced. When I am choosing a side to defend or a table quarter to attack from on his tables I often find that there is little difference in each table quarter. He purposely lays out the terrain to generally balance the four quarters of the board so no one section provides too much of an advantage to either the attacker or the defender. In general, I try to follow this when designing my own tables. I try to have relatively equal density of similar terrain in each table quarter. For example, if I have line of sight blocking terrain like trees in one quarter I will try to have roughly equal amounts of line of sight blocking terrain in each quarter. Here's a game against Sean on one of Glen's tables. Variety is the spice of life (or so they say). A few different types of terrain on a table can add interest and more tactical choices. A mix of hills, open terrain, slow terrain, concealing terrain, and linear obstacles makes for good variety on a table. On the other hand, a strongly themed table can also work. For example, I want to make a Hurtgen Forest table in the future that is heavily wooded with only a few places to move more easily. Bocage tables are another example of this. I put this table together at the last moment before the Kelowna tournament. The table lacks a theme and a focal point. The river is interesting and has a good variety of crossings. It really needs a small town on the board or a better bridge to add a reason to fight over this point. The brown felt needs some paint too. As a tank player, I think it is important that tables be laid out with mobility in mind. There is definitely an element of bias in this. In my opinion, it is important to consider mobility when planning a table. If you lay down long hedgerows with that are difficult or very difficult going then you should have periodic openings to allow tanks to move through them. If you have rivers, then three or more potential crossing points is ideal to prevent too many choke points. I think openings allow for strategic choices by allowing many different outcomes to occur. When you set up a hill or slow terrain, allow options to move around the slow terrain in some places. This is a poor picture of my winter table set up. The layout of the terrain has been fairly balanced in game play. The village buildings are staggered to block lines of sight a bit. The terrain is medium density but there are no choke points that tanks cannot pass through. I think some more restrictive linear terrain would actually make this board more interesting. When I am setting out terrain I try to think of both long and short edge deployments when I look at sight lines along the table. Having some long sight lines on a table is fine. 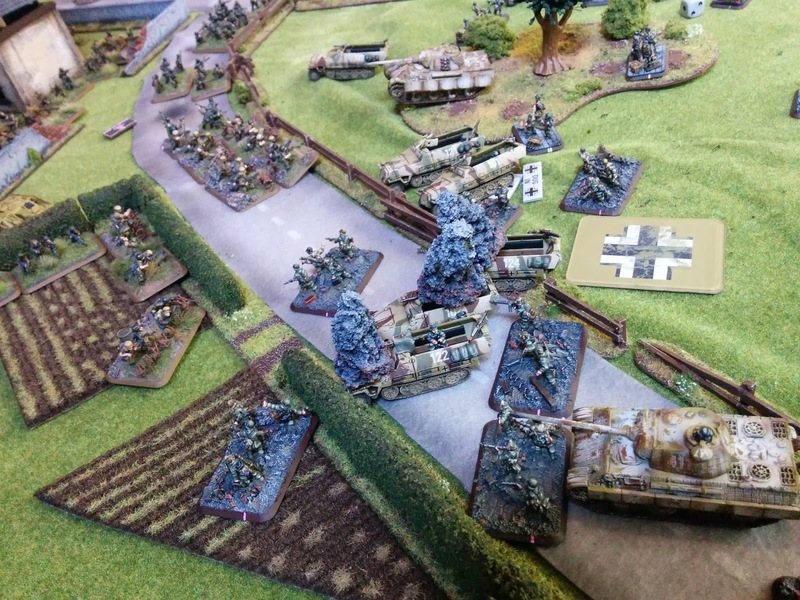 It makes for a more interesting game if the table is not dominated by very open sight lines for artillery and heavy tanks. I try to set up my tables so that long sight lines are fairly limited. Make those observers work for their artillery barrages! One way I do this is by putting area terrain like trees in areas that would otherwise be very open sight lines. Another thing I do is to stagger my buildings so they provide staggered cover from different angles instead of having them neatly in a row. A picture of my Normandy table from the Kelowna tournament. Geoff is sneakily moving his infantry through the hedges and behind the fences to get concealment. The mix of terrain types (and night attacking!) has allowed him to get close to me intact. Flames of War looks great on the tabletop. The scale lends itself to very cinematic games on a nice table. Laying out terrain in a realistic and natural way adds to the feel of the game. Random clumps of terrain can look a little silly. Some forethought can allow a table to take on character and provide something worth fighting for. You can do this by arranging your buildings to form a small village or putting hedges and walls along roadways. Small complimentary pieces like statues can provide a focal points for a scene. Along the same lines, a strong theme for a table can help to create a great setting for a game. A theme can be as simple as a desert or winter board or as elaborate as a specific suburb of Stalingrad or the Battle of Kasserine Pass. A sense of coherence, theme, and realism can add to the aesthetic value of a table. This table is Bradford's. It has a very realistic terrain layout. It looks like a real place when you are playing on this board. He had an even nicer board that I forgot to photograph at the tournament. I'd love to hear your thoughts in the comments on what makes a good terrain table for Flames of War. These are my thoughts based on my limited experience at tournaments and the limits of my own terrain collection. I've had a few comments about terrain for Flames of War on twitter. If I get enough responses I'll post a follow up of thoughts from some different players. Thanks for visiting. For a winter table, you can get a big bag of winter flocked trees at Christmas time from Canadian tire for $10-$15. They work out really well. Also, if you can get your hands on the weekly %40 coupons from Michael's, they often sell pre-made trees from woodland scenic with the discount they are a steal, just mount them to a big steel washer. Ikea is a cheap place to get blank front door mats for fields, some good online tutorials on how to make them look pretty sweet. Thanks for the tips Paul. I meant to pick up some of those trees at Christmas but they were gone before I did. Next year! Oops, I meant Phil. Sorry! Pretty sound advice there Cameron. Tournaments are tricky because you have to cater for so many different forces and missions. Heavily themed tables are good for one-off games, but in tournaments it has to be all about balance. I think you hit the nail on the head when you mentioned the terrain allowing for different choices. A well balanced table will give both sides options to use or not use the terrain, with risks and rewards each way. Good post on something that's always a hot topic! Thanks for the comment Paul, I agree. Balanced terrain is important for tournaments. A game on a big bocage table can be quite memorable though! Great post - useful, too. I'm moving into 15mm WW2 and FoW figures and vehicles offer the obvious solution. Nice one. You won't regret the move into WW2 15mm, Monty! Pretty much directly inline with my own thoughts on tourney tables. I learned from the best :-). I meant to get more pictures of the tables at your tournament but I didn't get a chance with all the games on them. I think your tables are very balanced between sides and quarters. Thanks for the note Cameron. I wanted to make a small addition with regards to rivers. These are some of the rules I follow with rivers. 1) Rivers should never follow a center line! For instance I might have a river that cuts the board along the long edge (so for short board edge deployment) that starts at 2 feet in on one side and then ends at 2 feet in on the other side. This way you never get a massive obstacle that perfectly helps a defender in something like Hold the Line. 2b) River MUST have a minimum of one crossing per 1.5 feet with a minimum of two bridges as two of those crossings. 3) Rivers should make sense in regards to the rest of the terrain (bend with hills etc), thought this is true of all terrain features. I shall conclude by saying what I should have started with. Great article Cameron, always a pleasure to read and talk! Glad you have joined the Western Canadian Flames of War Community! Thanks for the detailed reply. Who is this? I'm guessing one of the Calgary guys...? I like your idea about rivers not being straight. I've run in to that problem before too. Some large obstacles can become free fortifications in the short edge scenarios. I have the same problem with my low bankment train track. I usually play it as just slow going otherwise it becomes a long fortification. It is Bradford. Sorry, not sure why it didn't sign it like it normally does for me. Weird. I would also say that the train track being a long fortification is actually a good thing. It just needs to be placed in a way that makes sense from a geographical stand point and fair from a game stand point. That is always the key. An example of this would be that I actually realized after the tournament started that my table that you have a picture should have had another road or open path through the one large field to get from short edge to short edge. I usually plan for that kind of movement but had missed it in that table. Oops! I thought it was probably you. Hahaha. Thanks for the comments. It is hard to plan for every eventuality with each table. Challenges of an individual table are part of the challenge of the game. Effective use of the terrain you are dealt is part of being a good player. That's part of what I love about FoW. You interact with the terrain. I found with whfb that everyone just avoided terrain (especially when they got random crazy effects in 8th edition). I completely agree. Warmachine is the same. Everyone avoids everything except hills. Mostly because hills are broken. I much prefer to interact with the terrain! Despite not being (or playing) competitive(ly), I struggle with terrain anyway, simply because I'm one of those annoying players who has a complete blindspot for terrain. I always try to get the other player or a third party to place my terrain - simply because I just cannot make it make sense! Thanks for the comment, drax. It took me a long time too. Getting a third person to set up terrain is always nice too. Very much like this article - well written mate. Haha. Agreed. Vets in buildings are nearly impossible for tanks. We usually have buildings more towards the middle to mitigate that somewhat. City boards look so visually appealing though. I would tend to disagree. I believe that being able to deal with Infantry and infantry in fortifications (whether brought or terrain features) is something that you need to plan for in a tank list. TBH my tank lists are often better suited for Infantry than other tank lists because infantry lists are a harder nut to crack. I've found my tank lists have been moving more that way too. I can compromise on how well I can deal with tanks but need a extra tools for infantry. I'd like to play around with some breakthrough guns and flame tanks. So far my solution has been lots of pzivs and lots of panzergrenadiers. Do you have any photos of your other board? I'd love to add a picture of it. It was the most thematic and inspiring FoW boars I have seen to date. I wanted to take a picture but people always had books and lists on it and I didn't think it would be doing it justice to get a photo like that. Hopefully I'll get a chance to play on it sometime soon. Maybe attack x. Did you see my Wiking armoured? It had no infantry but Hummels and flame tanks as well as Panzer IVs that rerolled skill checks. I don't have a picture but Igor might. I will check with him. I concur absolutely and have been doing this since 2009. Check my blog comments for some sets. Houseofhengist.blogspot.co.uk.